Vice Admiral Sir Henry Kellett KCB (2 November 1806 – 1 March 1875) was a British naval officer and explorer. Kellett joined the Royal Navy in 1822. 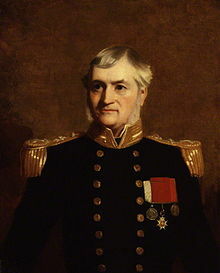 He spent three years in the West Indies and then served on survey vessels under William Fitzwilliam Owen in Africa, as second in command of HMS Sulphur under Edward Belcher in the East Indies, and as captain of HMS Starling in the First Opium War with China during which he was promoted to Commander in 1841 and Post-Captain in 1842. In 1845 he was appointed captain of the survey ship HMS Herald as part of a hydrography survey mission whose primary mission was to survey the coast of North America from Guayaquil to Vancouver, including the Galápagos Islands. He was temporarily reassigned in 1848 to join the search for Sir John Franklin. During this voyage he sailed through the Bering Strait across the Chukchi Sea and discovered Herald Island. Kellett landed on Herald Island and named it after his ship. He also sighted Wrangel Island in the western horizon. William Pullen was on this expedition.In 1852, he commanded HMS Resolute and went to the aid of Robert McClure, whose vessel, Investigator, was trapped in the Arctic. His men constructed a storehouse on Dealy Island off the south coast of Melville Island. He became Senior Officer in the West Indies in 1855 and superintended Jamaica Dockyard. Admiral Superintendent of the Malta Dockyard in 1864 and Commander-in-Chief, China Station in 1869. He retired in 1871. Several places in Hong Kong have been named after him: Kellett Island, Kellett Bay and Mount Kellett. Kellett Bluff on Henry Island, Washington, USA, was probably named after Captain Kellett as well. It is a place with extreme currents, views, and is frequented by feeding orcas. Kellet's whelk Kelletia kelletii is named after him. ^ Barr, William (2007). Arctic Hell-Ship: The Voyage of HMS Enterprise, 1850-1855. Edmonton: University of Alberta Press. p. 7. ISBN 0-88864-472-8. ^ Quanchi, Max (2005). Historical Dictionary of the Discovery and Exploration of the Pacific Islands. The Scarecrow Press. p. 87. ISBN 0810853957. ^ Wordie, Jason (2002). Streets: Exploring Hong Kong Island. Hong Kong: Hong Kong University Press. p. 141. ISBN 962-209-563-1. ^ Yanne, Andrew; Heller, Gillis (2009). Signs of a Colonial Era. Hong Kong University Press. p. 41. ISBN 978-962-209-944-9. ^ Forbes E. (1850). "On the species of Mollusca collected during the Surveying Voyages of the Herald and Pandora, by Capt. Kellett, R.N., C.B. and Lieut. Wood, R.N.". Proceedings of the Zoological Society of London 18: 270-274. plate IX, figure 10. This article is based on a translation of the article Henry Kellett from the French Wikipedia on 13 December 2006. O'Byrne, William Richard (1849). "Kellett, Henry" . A Naval Biographical Dictionary . John Murray – via Wikisource. Murphy, David. The Arctic Fox: Francis Leopold-McClintock, Discoverer of the Fate of Franklin. Dundurn Press. ISBN 978-1-77070-179-3.